We think we know celebrities because they're so familiar to us, through television, radio, magazines, or sport. Even the gossip about them sometimes has a thread of truth. However, there's nothing like a memoir or autobiography to get the "dirt" firsthand, as it were. It's no surprise people do odd things in their lives but it must be horrendous knowing the whole world is keeping tabs on you and your every move. So, when Christina Claire Ciminella "created" Wynonna Ellen Judd, in a way, she put her life on a different course, or so she thought. 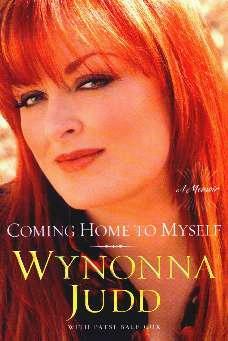 Wynonna tells us about her childhood and adolescent years and how she followed her creative and musical talents all the while feeling as though she never fitted in. Suffering abuse (all abuse is bad and leaves scars!) and insecurities is never easy and not having money while growing up, or moving as often as she and her family did, could not have been easy. We get to hear about their move to Nashville, the formation of The Judds, their loves and losses, ups and downs, and Wynonna's intense love for her famous sister Ashley. Their first song, in 1983, was "Had A Dream" and it's interesting to read how they got going in the music industry - hard work! And Mama Judd was no walk in the park. Then we hear about her shyness and how she turned to food for comfort. She says, "But food is just a slower form of suicide." I completely agree as I've been there, only in reverse. And then, at age 30, she learns the huge secret her mother kept from her while so many others knew, including her little sister. She also says, "There's a lot of shame that one carries in being too sensitive," which I too, completely agree with. Country music may not be everyone's cup of tea, but a real-life story usually captivates and probably will be grist for the music writer's mill. Conclusion - A very interesting and positive book.